It's been said that Rock & Roll will never die, but sadly it has a long history of eventually killing everyone who attempts to keep up partying with it. 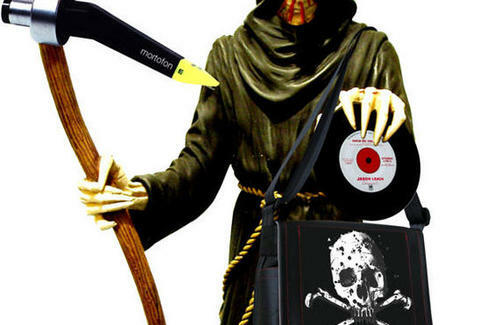 Since you can't beat it, join rock eternally, with And Vinyly. From a U.K. music producer who began considering his own mortality when his mum began working at a mortuary, AV'll immortalize your physical body by pressing your ashes into a run of playable 12" records, all so you can "live on from beyond the groove" in more than just your friends' hearts, which is sure to Dee-lite everyone. Each 12-minute side gets stuffed with tracks of your choosing, which in addition to actual tunes can include the poetic "pops & crackles" of your dust on a silent record, "bespook music" recorded by their in-house band (in accordance with your full input on style, lyrics, beats, etc), and a reading of your will backed by classical music or reggae, ensuring there'll be wailers present other than those induced by your miserly distribution of possessions. Other available options include original sleeve artwork produced with paints that have been mixed up with your scorched remnants; the choice to only use part of your body, for those looking to also "dig it"; and the distribution of your record to worldwide "reputable vinyl stores", so you can also be eternally judged by people who just think they're god. They'll even help plan a FUNeral at which your final death rattle can be aired, and where experienced event organizers'll crack some jokes, "embarrass someone", and make attendees dance, the perfect final way for those who died partying like rock stars to test everyone else's death mettle.